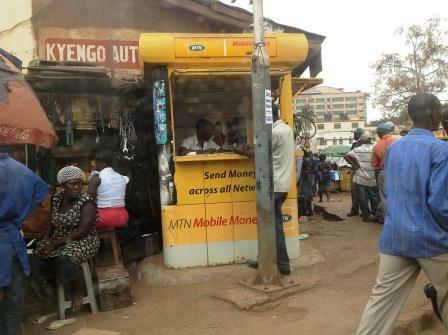 Street scene downtown Kampala. The booth in the center allows people to send money to others using cell phones. 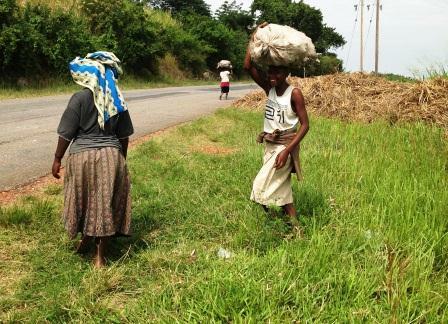 A new study shows an increasing gap in poverty between rural and urban Ugandans according to the country’s leading newspaper, the Monitor. According to the report, 20% of urban Ugandans while only 2% do in rural areas; 4% of those living in the city have a car while less than 1% of those living in rural areas do; the numbers for bicycles are reversed: 20% of households in urban areas own a bicycle, 41% of rural households. These figures must also be considered in context as over 80% of Ugandans live in the countryside but the cities are growing quickly because of the perceived opportunity there. The report underscores the inequality of wealth in Uganda, a country with a very uneven distribution of family income. According to the World Bank, Uganda’s GINI Index, a measure of income inequality was 44 in 2009 rivaling that of the United States. (The higher the Gini Index, the more inequality). To get a sense of what this means, the poorest 10% of Ugandans had received just 2.3% of all income while the top 10% received over 36% of all income. The Organization for Economic Cooperation and Development estimates the U.S. Gini Index to be 49 in 2009, the highest among all developed countries worldwide. Again, a look at who gets what is instructive: in the U.S.: the top 10% of earners have an average $87,257 after taxes while those in the bottom 10% have incomes of $5,819 according to an October 21, 2008 report of the respected British magazine the Economist. Hi Dad, Very interesting, yet also disheartening. How about posting some photos from your trip to the countryside? I love the one of the mama and baby baboons.